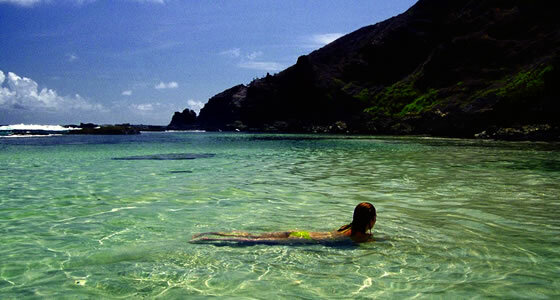 Praia do Atalaia Beach, Fernando de Noronha, Brazil. Praia do Atalaia falls under the control of the marine national park. Praia do Atalaia is also called the Atalaia Beach. This beach falls under the jurisdiction of the marine national park and has stringent rules for visitors and any kind of human activity. You have to make sure you have the special visitors permit obtained from the national park head quarters. You can choose to access this beach either by taking a trail from Vila do Trinta or drive down to the beach. Entry is restricted to only 20 buggies a day. Atalaia Beach boasts of a natural aquarium because when the tide is low. The area is very shallow and visibility in the water is very clear, so you get to observe different colored fish, octopus and a variety of marine life. They allow visitors to go scuba diving here, but again it’s restricted to 30 divers at a time with a complete ban on using any kind of sun block. High tide brings good view of ‘nozzles’, a place where the waves jump at great heights as they beat against the rocks. In the middle of the sea there is a mount called Morro do Frade and towards the left are the ruins of salt works which were operated centuries ago by the Americans.